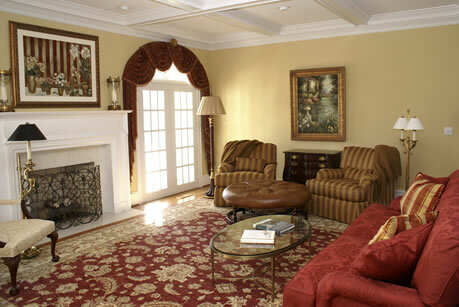 Becoming Homes is an interior design firm serving clients in the Southeast for over 20 years.. Becoming Homes incorporates the latest in furnishings, accessories and fine art into timeless design uniquely expressing the client's personal style. 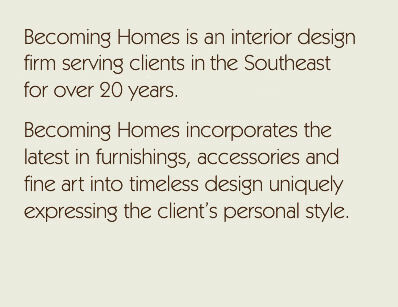 Founded by Julia McDuffie in 1986, Becoming Homes has provided cutting-edge, cost effective interior design to residential and professional clients throughout the Southeast.Â Juliaâ€™s work spans a diverse range of styles, each uniquely representing the tastes and needs of each individual client. The name "Becoming Homes" symbolizes Juliaâ€™s design philosophy, to transformÂ â€œHousesâ€� into â€œHomesâ€�, providing maximum utilization in an aesthetically pleasing way. The appropriate â€œstyleâ€� for any client is unique to that individual, couple, family or, in the case of professional spaces, the individual practice or firm.Â For Becoming Homes, the first step in the design process is getting to know clients, their interests and lifestyles, which help to define their design objectives.Â The goal is to produce an environment reflective of the client while applying design principles that are both cutting edge and timeless. Becoming Homes' services include interior design for New Construction, Remodeling/Renovation, Revitalization of Existing Spaces, Floor Plans and Home Inventories, and Commissioned Photography.